Tough growing--yet delicate looking--deciduous Japanese grass with arching foliage, 2 ft long yellow leaves striped in green, with tinges of pink in the new growth and again in autumn. These form clumps to 16" across. Best in full to part sun in rich, well-drained soil with consistent summer water. Cut back to the ground in late winter before new growth. Frost hardy to -20F, USDA zone 5. A Cistus introduction, originally given to us as an unnamed seedling by Hythe Nursery of the United Kingdom. 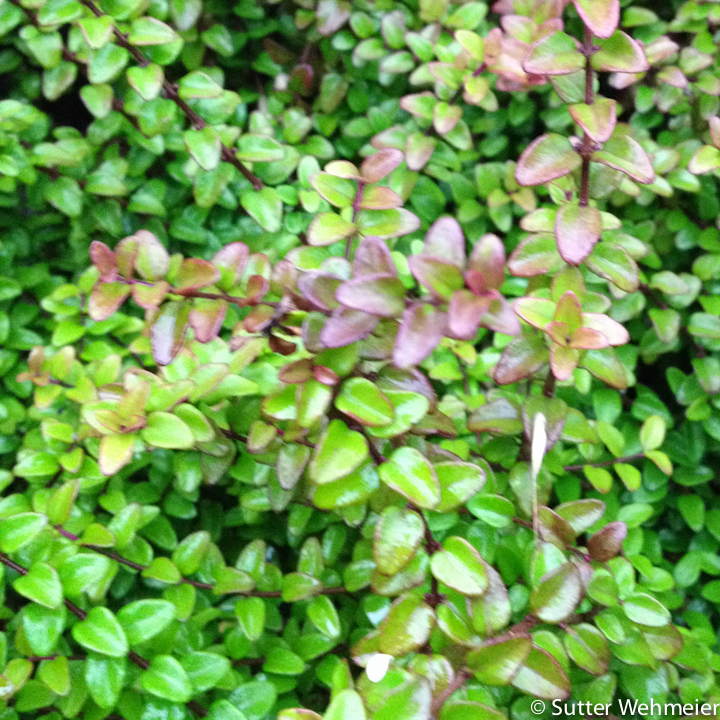 Dark green foliage year round and dark violet flowers in spring and summer make this hebe stand out. Can reach 2 ft over time in full to part sun with average summer water and good drainage. Frost hardy to 10F, USDA zone 8. Found near the Esk River, South Island, New Zealand. Low growing whipcord to 2-3 ft. Apparently a natural hybrid of H. odora and H. armstrongii. Green in summer turning gold in winter. Sun to part sun, good drainage and normal water. Has been surprisingly hardy to frost to low USDA zone 8. Striking and colorful evergreen shrub, the dark green, narrow leaves adding purple highlights in new growth and during cold weather. Late summer flowers are lovely spikes of lavender-purple. To 3 ft tall x 2 ft wide over time in well-drained soil in sun to part sun with regular summer water. Best protected from cold winter winds, but otherwise frost hardy in USDA zone 8. One of the prettiest of the Hebes, this mounding, little shrub -- to about 2 ft -- has long, narrow leaves of olive-green with wide margins of mustard-yellow going orange to pink -- all set amid purple stems! We don't remember what the flowers are like, but we know it has them. With or without, the plant is stunning. Wonderful container plant especially with maroon foliage companions. Sun to part sun, good drainage and normal water. USDA zone 8. One of the sweetest hebes around, a glaucophylla type with rounded leaves tinted powder blue and attractively streaked with cream and pink variegations. Evergreen, to only about 2 ft tall and wide, the form is dense and the colors striking. Spring flowers are pale lavender adding even more color. Hebes need good drainage in sun to part sun with summer water. 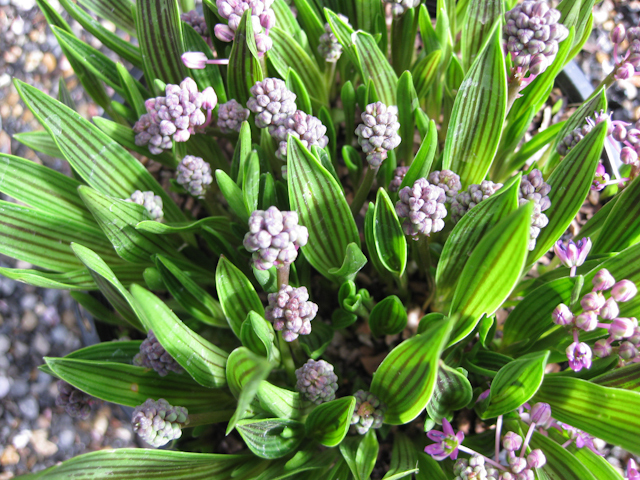 Also one of the hardier hebes, easily accepting USDA zone 8 and fine in zone 7 in the best conditions. Another introduction from County Park Nursery in the United Kingdom. A low, spreading shrub -- to 8" x 3 ft -- not quite as dense in growth as some of the mat-formers but the loose texture is nonetheless quite beautiful. 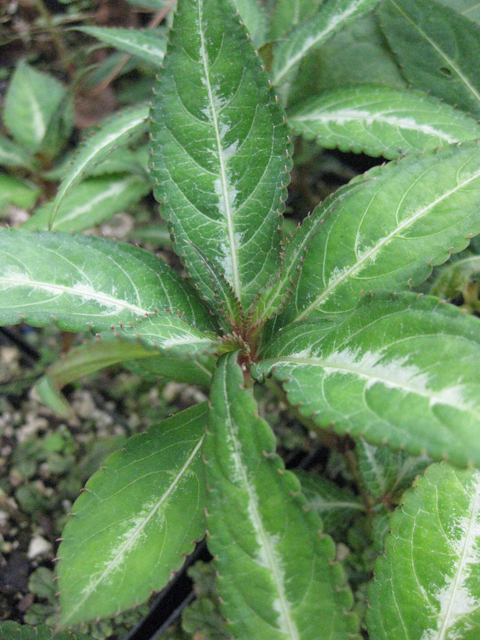 Gray-blue leaves with reddish margins on darker stems and narrow clusters of light blue flowers in spring and often again in late autumn and winter. Very good texture when combined with large-leaved plants. Sun to part sun, good drainage and normal water. Upper USDA zone 7. Gorgeous hebe, colorful in all seasons! Beginning with green leaves on dark purple stems throughout the summer, the leaves turn purple in winter with bronzing on the tips. 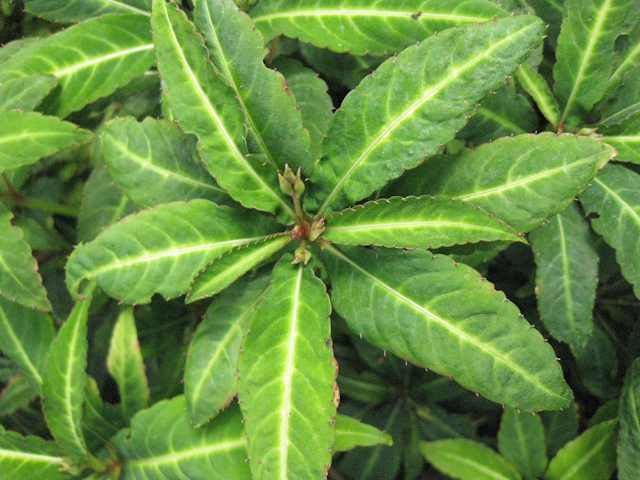 A small, evergreen shrub, to 3 ft tall x 2 ft wide over time with upright form. Best in sun to part shade in well-drained soil with occasional summer water once established. Frost hardy to 0F, USDA zone 7, with good drainage. Sweet, small hebe, to only 12" tall x 12-14" wide with small, pale green, succulent leaves, seemingly stacked along the stems, and clusters of white flowers in mid to late summer just in time to make the bees happy. Discovered by and named for John Buchanan, a Scotsman who botanised in New Zealand during the mid 19th century. Does well in full sun to light shade with very good drainage and summer water for best appearance. Frost hardy to -10F, USDA zone 6 with that good drainage. Hardy and drought tolerant, this Hebe's ever-gray foliage spreads at a height of 16" and blooms in early summer with clusters of pure white. Prefers well-drained soil and lots of sun. Frost hardy to 0F, USDA zone 7. 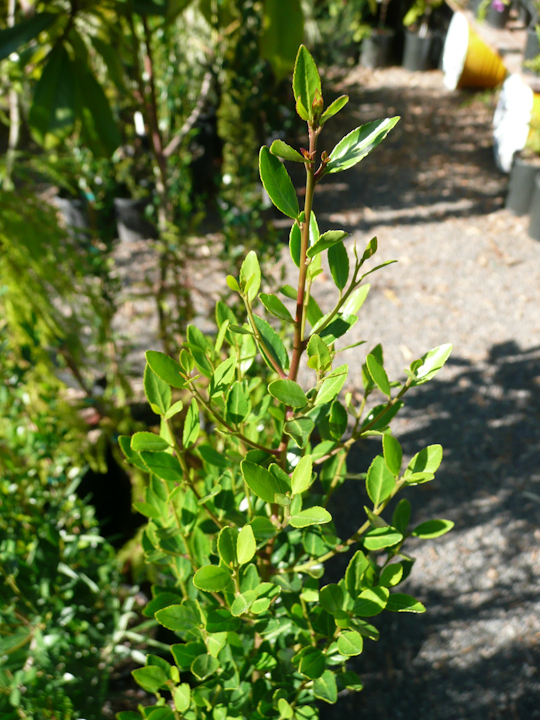 From New Zealand, an upright-growing shrub, to 4 ft, from around Westport and montane to lowland sites in the northwest part of South Island. The narrow, lanceolate to oblong leaves are a most attractive, bright blue-green. White flowers appear in early to mid spring and often into winter. Sun to part sun, good drainage and normal water. Frost hardy to the upper end of USDA zone 7. A very tall and bushy hebe, to an eventual 6-8 ft tall and wide, with long, narrow, willow-like leaves, and, in summer, spikes of white to pale lilac flowers. This form, collected by Sean Hogan, is found on New Zealand's South Island and expects "hebe" conditions, sun to part shade out of drying winds in soil that drains well with moderate summer water to establish and occasionally thereafter. Very frost hardy; easy to 10F, USDA zone 8, and accepts lower temperatures with excellent drainage. Rare plant from New Zealand, largely confined to catchment of the Clarence River, growing on slopes and valley floors from 3,600-5,000 ft in Nelson, Marlborough and N. Canterbury Mountains -- and, indeed, looking very much like pickle weed. A densely branched little "whipcord" -- usually under 15" -- with spring green leaves and white flowers in early summer on upright branchlets. A very architectural little plant that adds great texture to containers. Sun to part sun, good drainage and normal water. Has been reported frost hardy into upper USDA zone 7. A very hardy hebe with such compact, tight growth that it does, indeed, look like a trimmed topiary in maturity. 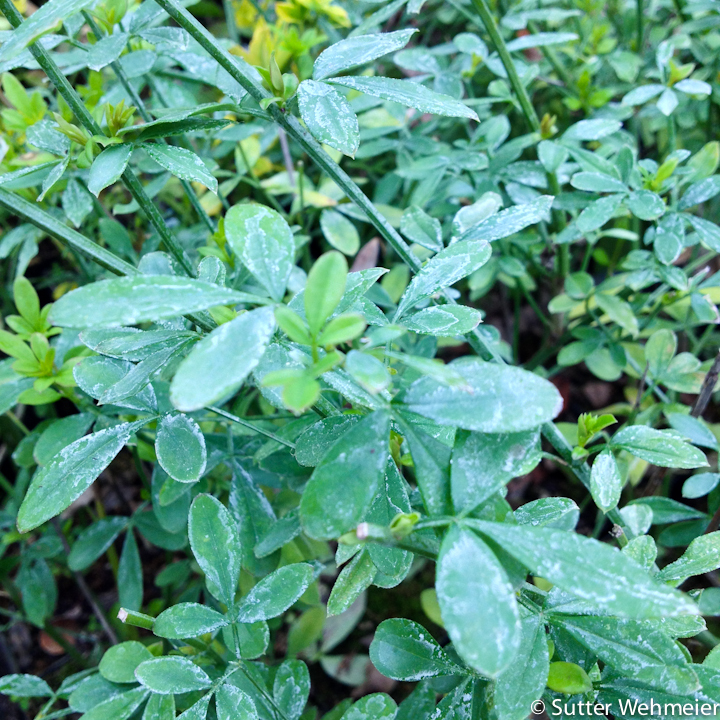 Leaves are gray-green with creamy edges and are held at an upright angle creating an interesting texture in an evergreen shrub that eventually reaches 3-4 ft tall x 4-5 ft wide. In the best of times, small, gauzy white flowers are decorative in late spring to early summer. Good drainage is important for hebes and full sun with occasional summer water. Frost hardy to 0F, USDA zone 7. Shared with us by one of North America's great centers of "hebeosity", the University of Southern California Arboretum at Santa Cruz, this is one of the most often remarked upon plants in our New Zealand border where 3 ft, nearly orbicular mounds of glossy round leaves set in geometric patterns make a stunning sight! All this with dark stems and the prettiest of blue flowers, usually late spring to early summer. Sun to part sun, good drainage and normal water. Frost hardy to 10F, USDA zone 8. 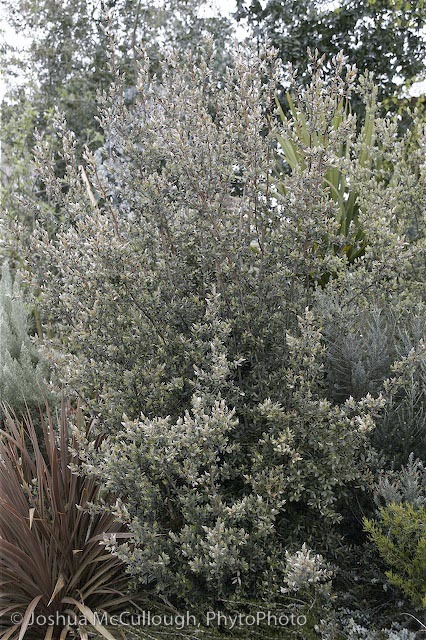 The grayest subshrub in our garden at present, growing to a compact 18" tall or so with narrow, indeed gray foliage densely held, look a bit like lavender. Flowers in late spring through the summer, clusters of pale buttons to amongst the foliage. Very easy and striking in bright light with good drainage and a little summer water. Frost hardy to -10F, USDA zone 6. This form shared with us by Hythe Alpine Nursery in the United Kingdom. Another new, large-flowering hellebore from Oregon's own master hybridizer, Marietta O'Byrne. 'Golden Sunrise' has a youthful combination of single, clear yellow petals with cheerful dark red picotee freckling and veining! To 18" tall and 24" wide. Perfect for woodland areas in part shade where it can spread out. Flowers, which can appear as early as January and last until April, are downward facing and large, almost 3" across! Trim old leaves to the ground in late winter before the buds emerge to allow flowers maximum impact. Very cold hardy. Zone 5. Featuring soft white single blooms edged in a lovely lavendar-pink, these beauties begin flowering as early as December. For part sun to shade in humus rich soil with average summer water. Cultivated in the gardens at Cistus Nursery. Frost hardy to USDA zone 5. A stunning, variegated daylily, the grassy leaves appearing in spring with a narrow, green center on a white field, the result of careful breeding over many years by Sybil and Walter Przypek of Virginia. Plants are small, to 12" tall in clumps growing to 18" wide. Into summer yellow flowers appear above the foliage which has turned to green in the warm weather. A lovely plant and a collector's dream. For full to part sun with regular summer water. Frost hardy in USDA zone 3. This super-cute hosta is a mutation of H. ‘Blue Cadet’, proving that sometimes a little mutation is good. 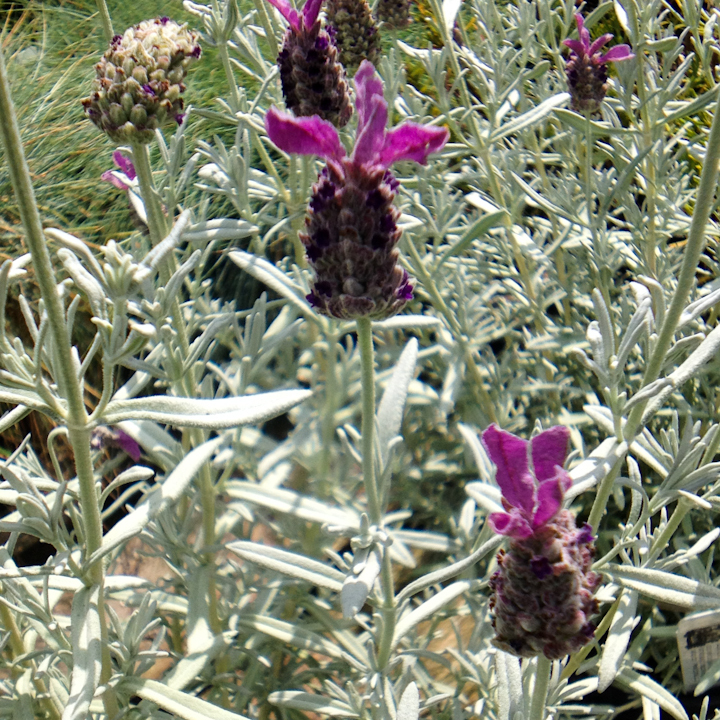 In this form small silver-blue leaves, slightly rolled at the edges, form rounded clumps, to 8" tall x 1 ft wide, topped in early summer with short, sweet spikes of lavender flowers. Best in light shade to shade where the soil is rich and summer water is regularly supplied. Frost hardy to -40F, USDA zones 3. 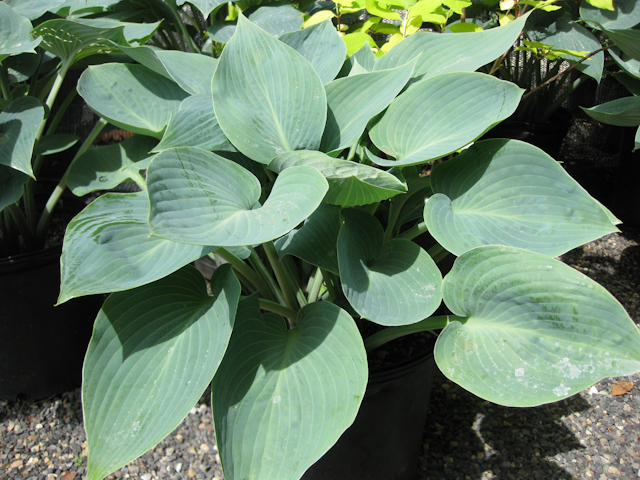 An all-time favorite of the blue foliaged hostas, this one forms a 2ft wide clump of 15” tall, rounded leaves, pointed when young. Holding its color well, it is a vigorous grower and durable, sending up beautiful blue-lavender flowers in summer. For part sun to light shade. Frost hardy in USDA zone 3. “Like a multitude of hands folded in prayer” according to Tony Avent, this ”un-hosta” grows to an 18" wide clump of folded and crinkled dark green leaves, with a narrow cream border. Sends up 18" spikes of light lavender flowers in late summer. For light shade in USDA zones 3-8. 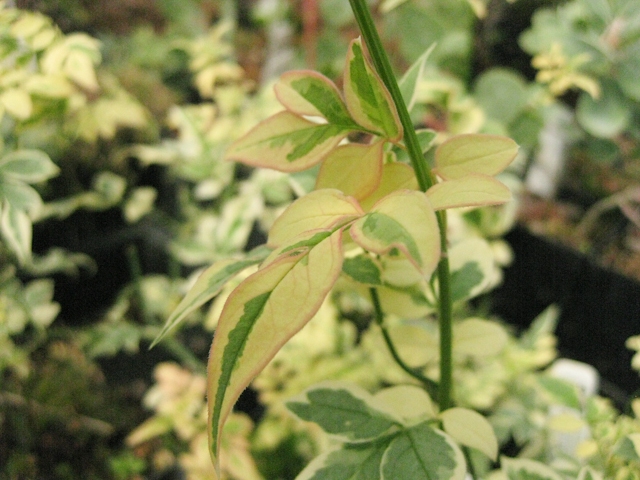 Brightly colored perennial with variegated leaves, in shades of red, pink, yellow, and cream, on red stems. Aromatic too, when crushed. Mid-spring flowers are tiny and green but the petal like bracts are showy and white. A vigorous spreader that should be planted where the rooting rhizomes can be restrained -- e.g. by sidewalks or buildings, etc. To 1-2 ft tall. Enjoys medium to very wet soils, even boggy conditions, in sun to full shade. Frost hardy in USDA zone 4. A charming mophead hydrangea with rounded clumps of abundant, small white flowers from June and continuing to nearly September especially if deadheaded. This cultivar is a compact shrub, to only 3-5 ft tall, with dark green foliage and sturdy stems that don't bend or flop easily under the weight of heavy rain. Blooms on new wood and benefits from late winter, hard pruning. Best in morning sun with regular moisture. Frost hardy to -40, USDA zone 3. Evergreen, climbing hydrangea blooming from June to September with lovely white lace-caps that bees and butterflies love. 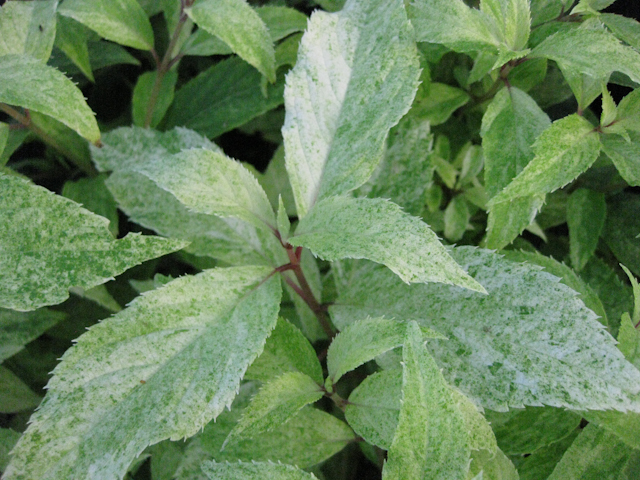 The shiny foliage brightens up any partly shady or shady spot. Rich soil and average summer moisture is best. Can reach 10 ft or more but is easily pruned in autumn or early spring. Though self-clinging, outreaching branches can break so some support is required. Very frost hardy to 10F, USDA zone 8. In our never-ending search for new hydrangeas, especially the evergreens.... this mid elevation species from Taiwan provides horizontal, rounded, glossy green leaves and rounded, flattened heads of fertile flowers surrounded by white to the palest pink, sterile bracts, over 1", appearing to float amid the dark green background. In our garden it has remained evergreen and rewarding, having only suffered during the dry, 20ºF cold spell of 2003. A plant for dappled shade in a protected corner, provided plentiful moisture and out of drying wind. Upper end of USDA zone 8; will recover from a bit lower if mulched. A mophead hydrangea with violet flowers and dense, glossy green, rounded leaves -- rather different from other deciduous hydrangeas. A small to medium shrub, to only 4 ft tall or a bit more, for sun or, in the hottest climates, dappled to part shade and rich, well-drained soil with consistent summer moisture. Frost hardy to -10F, USDA zone 6. This cultivar, shared with us by plantsman Ted Stephens, displays cream-tinted, pink splashed leaves which merge beautifully with the red petioles and new stems. Lovely upright flowers age gracefully through summer, becoming tawny seedheads for winter display. The older bark flakes a golden color, so best placed to catch the winter sun. Grows 5 ft tall, easily trained to 10 ft, and 5 ft wide. Afternoon shade in hottest climates and periodic water in summer. Frost hardy to 0F, USDA zone 7. Wow. Huge balloon shaped white flowers on this self-clinging, evergreen hydrangea. What more could you ask for? This hybrid by Martin Grantham of San Francisco grows quickly to 20 ft or more. Half sun is best with regular summer water. Frost hardy in USDA zone 8 with protection from most severe cold. 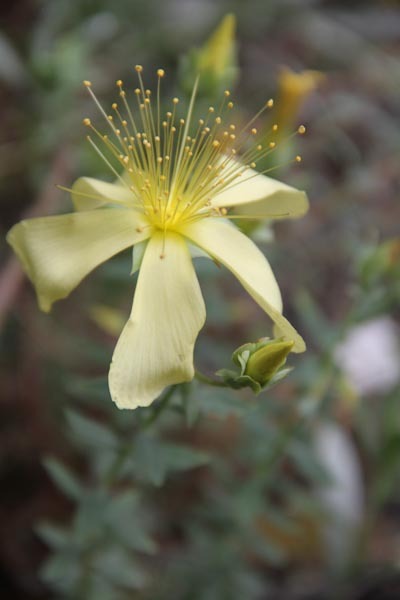 Tiny leaved St. John's wort, perfect for the well-drained, rock garden creeping along at less than 1" tall and producing golden yellow flowers in early summer. Full sun to part shade is fine with rich soil and regular summer water for best performance. Frost hardy in USDA zone 6. A particularly useful form of the oft used I. crenata, this miniature “Italian cypress” forms a handsome evergreen exclamation point in the landscape, growing to 5-6 ft or so, maintaining a very narrow width, often not more than 1 ft to 18”, a very good structure for the garden or container. Tolerant of dappled shade and certainly full sun, preferring at least occasional summer water. Cold hardy in USDA zone 6. A strikingly upright cultivar of a southeast US native, the form is columnar --like Italian cypress (Cupressus sempervivum), reaching 8-15 ft, though easily kept lower -- and accented with glossy, evergreen leaves, to about 1" long, and small, orange-red berries in autumn. On mature plants, the upright branches can lean and develop upright branchlets so plants are easily shorn or tied to retain a tighter presence. More tolerant of moisture than Italian cypress. Lovers of heat and tolerant of drought once established, they are frost hardy 0F, USDA zone 7, and are best in full sun to only lightly dappled shade. As the name suggests, the fruit should not be eaten. Given to us by the late J.C. Raulston and name after the great holly man himself, Tom Dodd, comes this fairly rapid-growing hybrid, which forms an 8-10' pyramidal shape in a few years and then slowly marches to 20-25'. 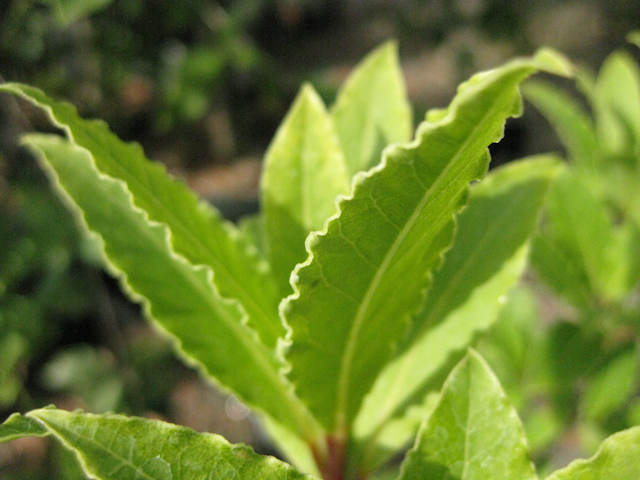 Leaves have a most interesting ruffled texture and gloss, giving it an almost artificial appearance. Excellent screen, easily hedged, but we think it's better looking if you don't. USDA zone 7, possibly 6. Sun to 3/4 shade. Give it a little extra water in summer dry places. Excellent container specimen. Golden yellow form of the Florida sweet anis selected from a vast array of seedlings by plantsman Tony Avent. Native of the southeast United States but seems to thrive anywhere (excepts deserts) in USDA zone 7 or above. To 5-6 ft tall. Burgundy flowers are quite a contrast to the foliage. 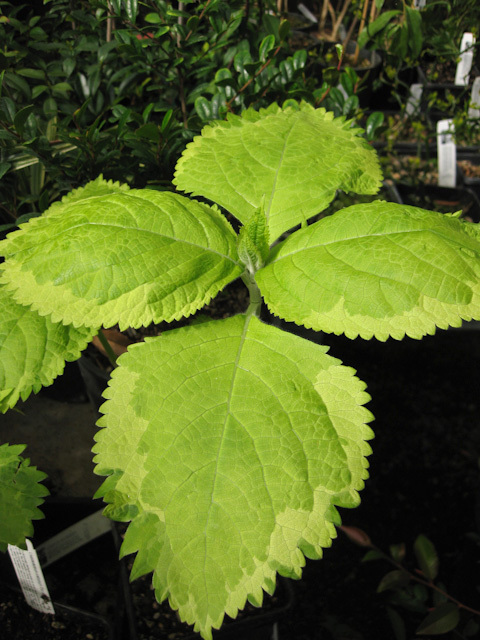 Plant in dappled or at least afternoon shade to maintain foliage color. Best in well-drained soil with summer water in dry places. This wonderful selection was shared with us by Mr. 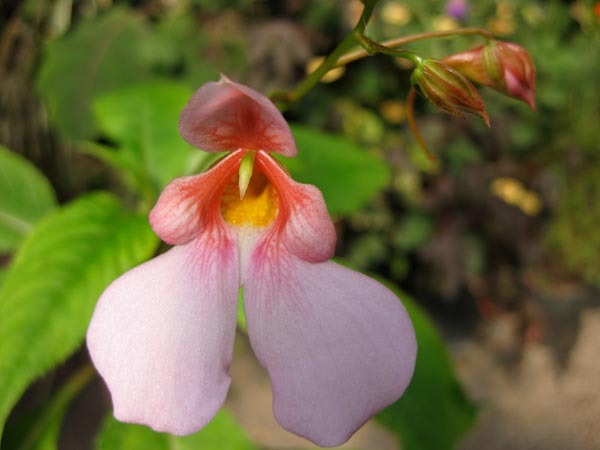 Impatiens himself, Derick Pitman, hailing from Arunachal Pradesh in northern India, and differs from the usual yellow blooming form in two ways. First, it bares distinct maroon spotted stems, and second, red calyxes from which paired blooms emerge as early as late spring in cool climates. From damp places, preferring cool temperatures and rich, moist soil, and bright light for best bloom color. Similar to I. mengtszeana, up to 18" in height and rambling wider, though not quite as aggressively. Hardy to USDA zone 9b, most likely root hardy to zone 8. Very new to cultivation and rare, this species from East Africa grows to 3 or 4 ft on red, potato-like, prolific, tuberous roots and produces masses of orchid-like flowers on tall stems with magenta upper petals and large soft pink lower petals. Very exotic. For shade and moist soil. From a low elevation, but surprisingly frost hardy, to 10F, USDA zone 8, or lower. A handsome, hardy dwarf impatiens, winter deciduous, with cream-yellow flowers hidden by the handsomely variegated foliage. Reaches 8-10” tall and spreads slowly but has not seeded around. Part shade to shade with regular moisture. Very well behaved and frost hardy, resprouting in USDA zone 7, and possibly lower, with mulch. A diminutive, wide-leaved form of this somewhat uncommon species from China’s Mt. Omei, this form with green leaves dusted silver and golden flowers beginning late summer and lasting to fall. Another lovely impatiens from Mr. Impatiens himself, Derick Pitman. Easy to grow in light to heavy shade if kept moist - the deeper the shade the more silver the leaves. Perennial and frost hardy in USDA zone 7. A diminutive, wide-leaved form of this somewhat uncommon species from China’s Mt. Omei with leaves dusted silver-pink and golden flowers beginning late summer and lasting to fall. Named by Mr. Impatience, Derick Pitman, of Sacramento, CA. Easy to grow in light to heavy shade if kept moist - the deeper the shade the more silver the leaves. Perennial and frost hardy in USDA zone 7. This wonderful new selection of the Mt. Omei impatiens spreads slowly into a dense colony of 6" bronzy stems and gorgeous leaves in a dark bronzy green sprinkled with silver, like fairy dust, with central veins in pink that darkens and spills into the leaf. Yum. Mustard to salmon flowers make a great contrast from late summer to frost. Shade to deep shade in moist soil with, of course, summer water. Frost hardy in USDA zone 7. A shrubby, miniature angel's trumpet from the Andes of Chile and Argentina, one that can be maintained as a deciduous shrub of 6 - 8 ft. Flushed with sheets of white bells in spring and summer, occasionally in the fall. Sun to part sun. Somewhat drought tolerant once established but best with regular summer water. Root hardy to USDA zone 7 and top hardy to zone 8 or above. Amaze your friends. A Cistus introduction. Visitors to our gardens seem always to be drawn to this hardy deciduous shrub. Deep indigo bells, like miniature Brugmansia flowers, cover it in summer. Sun to part shade with regular water, this fast grower can reach 6 ft or more but is easily pruned to shape in spring. Be the first on your block... USDA zone 8. This native of Uruguay was selected for its deep, uniform blue-purple color and its large flower size. A hardy bulb, its foliage appears with the flowers in early spring, then fades in summer heat, returning in September. Best in light shade in rich, light soil with regular summer water. Extremely easy to naturalize. Frost hardy to -20F, USDA zone 5. A Cistus introduction. .well, kind of. Actually grown from seed from the fabulous plantswomen Ginny Hunt. Of all the plants, this clone has much larger, more deeply purple-blue flowers on robust, evergreen plants from November often into April. Handsome year-round. Good for winter cut. Sun to light shade. Cold hardy in USDA zone 7. 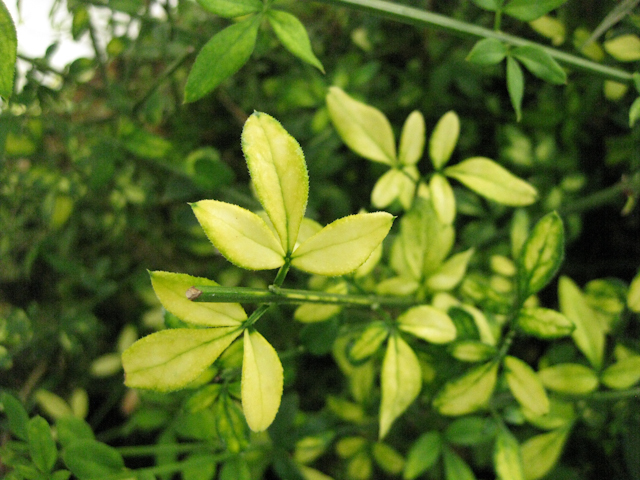 Also known as Jasminum primulinum, a mounding shrub to 4-5 ft or a vine to 10 ft or more, these with green leaves and some gold variegation. But the flowers are bright yellow and double, very striking from spring through autumn. Sun for best color but very adaptable to shade. Drought tolerant though appreciates occasional summer water in dry climates. Frost hardy to 10F, the bottom of USDA zone 8. Shared with us by Ted Stephens of Nurseries Carolinianus. Rare, diminutive form of the winter jasmine, reaching to less than 4 ft tall but bright with yellow-splashed leaves and, before the leaves appear, the same yellow flowers as the species in late winter to early spring. The willowy stems are attractive as well in winter. Beautiful year round for espalier, hanging baskets, or ground cover. Flowers best in bright light, sun to part shade. Very drought tolerant once established. Frost hardy to -10F, USDA zone 6. 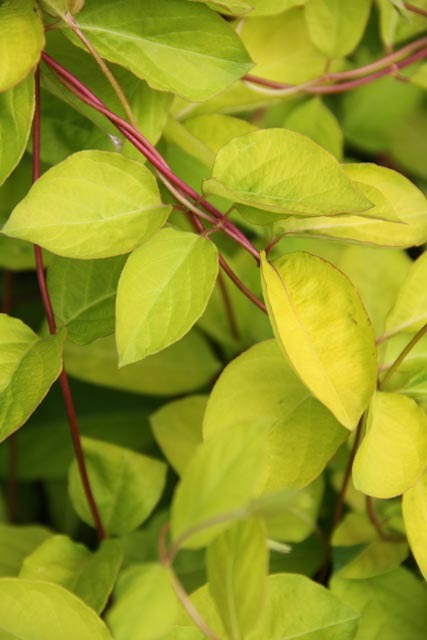 Lovely and vigorous, deciduous vine, with gray-green leaves edged in white and emerging very red in spring. A climber to 10-12 ft or so, but easily kept smaller. Blossoms are white and very fragrant in mid summer to early fall. Plant in good, rich soil in full sun or part shade with summer water for best appearance. Bees, butterflies and hummingbirds will love you. Frost hardy in USDA zone 7. A small-flowered species from the wilds of New Zealand with outrageously if not screamingly colored flowers -- but that's all relative; for New Zealand these are a light lavender. One inch, ruffled, evergreen leaves on 3-4 ft dense shrublets. The flowers are cupped and abundant in late winter through spring and occasionally throughout the seasons. In most places, they are best as container plants. In the garden, they are best suited along the Pacific coast in garden areas with low fertility where they can be kept cool and humid. Deep shade to dappled sun. Frost hardy to upper USDA zone 8 on the "left" side of the country. Adorable little succulent for the rock wall, outdoor container, hellstrip, or random little nooks and/or crannies....Sun to half shade in well-drained soil. Quickly forms dense colonies of tight rosettes. Plenty hardy! USDA zone 4.
handsome gray foliaged rush. Easy in the garden given moisture. Clumping and carefree. 2' tall arching form with greenish flowers stalks in summer. Happy next to or in water. Choice evergreen vine with handsome, variegated leaves, shiny green, irregularly edged in creamy white -- sometimes entirely white. This magnolia relative, found in China, Japan, and Korea, eventually reaches 15 ft tall and 10 ft wide, twining on pergolas, sculptures, fences, or anything handy. Spring flowers, also creamy white, are cup-shaped and add to the show, as do the fall clusters of red berries. Brightens any shady spot that has rich soil and receives ample summer moisture. Frost hardy in USDA zone 7. These South African natives, from the high Drakensburg Mountains, stand only 18" tall, forming a clump to 18" wide. Good for a small, perennial bed. Flowers are bi-color red and yellow on spikes. Easy in good garden soil with little summer water but lots of sun. Extremely frost hardy; to -20F, USDA zone 5. Visually striking evergreen poker from Australia that should receive more attention, perhaps even a little fame, in NW gardens. With large strappy leaves and tall orange-y flowers that open from the top of 3' tall stalks in the middle of winter (and are undamaged by cold), what's the hold-up? We're really not sure. Full sun best. Height and width both to around 3'. Drought-tolerant and fairly easy to grow, even along the coast. We recommend planting them against a bright blue wall or in a cluster of the dry garden near agaves, grasses, and the like. Frost hardy to USDA zone 7. Beautiful, vase-shaped small tree (to 25-30 ft tall x 20 ft wide) that covers itself with trusses of pure white flowers in late summer. Dark green leaves in summer change to bright red in the cool of fall. Cinnamon pealing bark on mature plants adds to the appeal. of this wonderful garden specimen or street tree. Full sun, good drainage, and regular water for best blooms. Frost hardy in USDA zone 6. Smaller growing crepe myrtle, to only 6 ft or so, with sprays of white flowers mid season to late season, starting in July around Portland or even August. Easy in the southeast. A wonderful contrast with dark foliage in any sunny but well drained, summer watered spot. 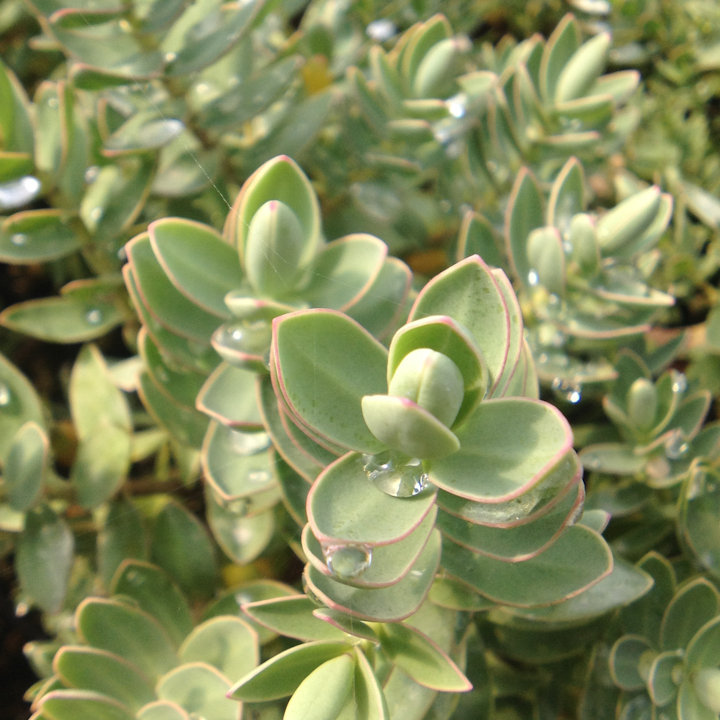 Can easily be kept as small standard or even smaller cut back shrub. USDA zone 7. 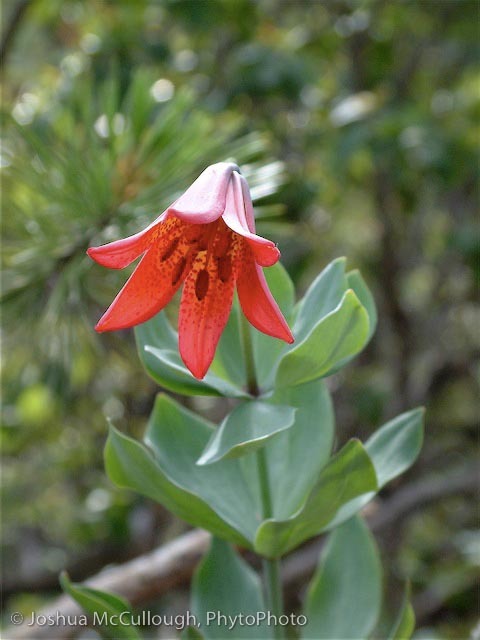 The national flower of Chile, rare in gardens, this distant lily relative inhabits the coastal rain forests of southern Chile where temperatures rarely hit 80F in summer or 20F in winter. 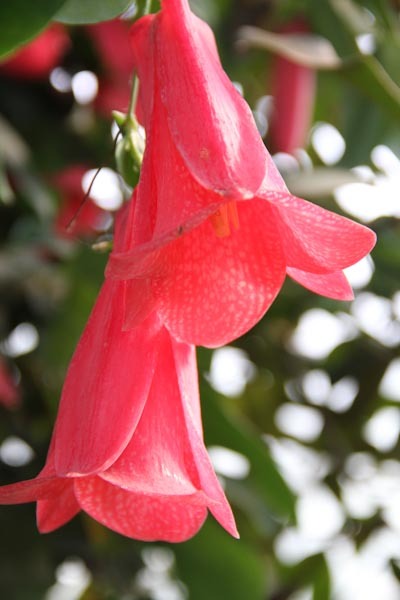 Waxy pink bells -- forms exist sometimes picoteed pure white or even blue tinted. We offer seedlings descended from the exquisite forms at the Nursery El Vergel in southern Chile, known for its Lapageria cultivation. Our plants, some flowering size, bear clear, warm pink flowers with a white lace filigree toward the end of each petal. In shaded, moist gardens of the Pacific Coast and with some success in the Southeast, L. rosea grows 10 to 12 ft with glossy, evergreen leaves and flowers sporadically year round but especially in fall and spring. Appreciates cool, infertile soil, even moisture and humidity, and fertilizers low in phosphorous and potassium. Wonderful container plants. USDA zone 8 out of wind; our garden specimens are on a detachable small chain so the plants can be taken down and covered should cold weather strike. Butterfly lavender is a perfect name for the flowers of Spanish lavender with the large (for lavender), showy heads of dark purple flowers with petal-like, purple wings on top. Blooms throughout the growing season. This is an upright and compact form, to 2 ft tall x 18" wide, with lovely, narrow, blue-silver, aromatic foliage, a perfect backdrop for the purple flowers. Best in full sun and well-drained soil with little to no summer water once established. Frost hardy to -10F, USDA zone 6. Sweet and easy bulb from South Africa with 4", narrow, olive-green leaves, upright and marked with purple stripes and spots. 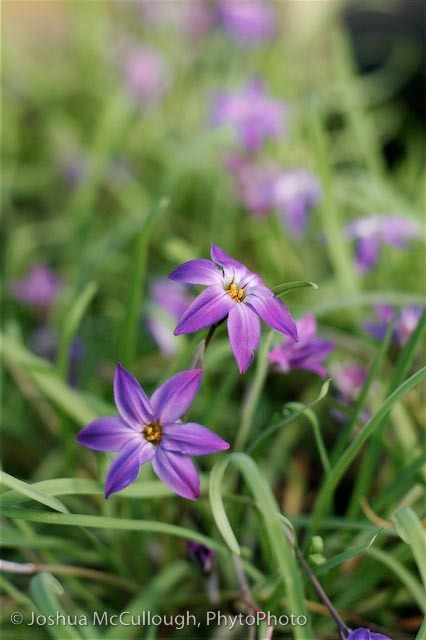 Decorative in themselves, and more so in spring when adorned with racemes of pink, scilla-like flowers. Spreads slowly to form a 1 ft wide clump. Easy in the garden in sun or part shade where good drainage can protect from too much winter wet. Tolerates some summer drought but accepts summer water as well. Frost hardy to 0F, USDA zone 7. Ground cover, to only 2" tall, and spreading by runners with ferny foliage, very black in this cultivar. Sun to part shade in well-drained soil. Prefers summer moisture but tolerates low summer water. Good for rock gardens or cover for gravel mulch where the color makes a good contrast. Evergreen to 20F and frost hardy in USDA zone 8, recovering quickly. Our clone from good friend Kevin Hughes, most recently of Hampshire's Spinner's Nursery. 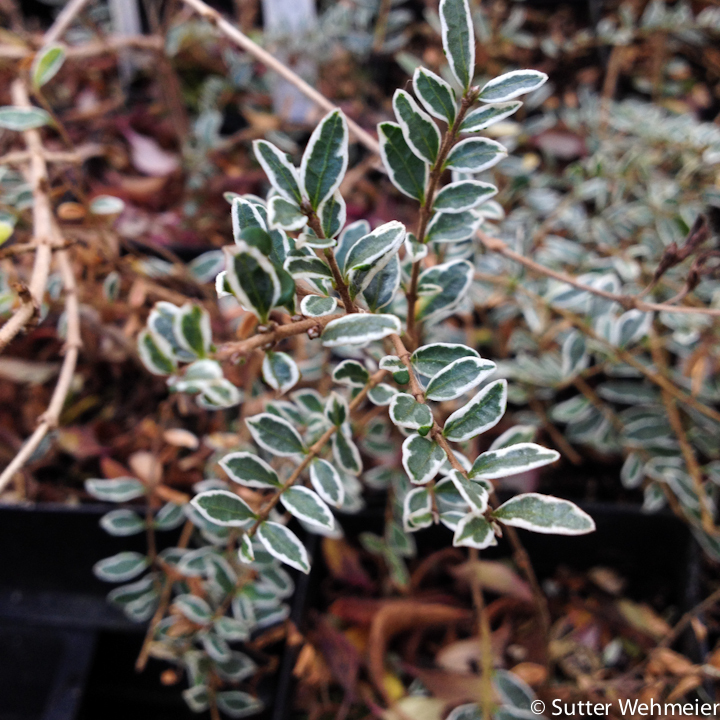 A shrubby tree to 10 ft or so with thick, gray-green leaves with a silver shimmer. In midsummer, the foliage is absolutely smothered with 3/4" whitish pink flowers, lasting a very long time. A must have for the proper garden. Frost hardy through the single digits F, USDA zone 7. 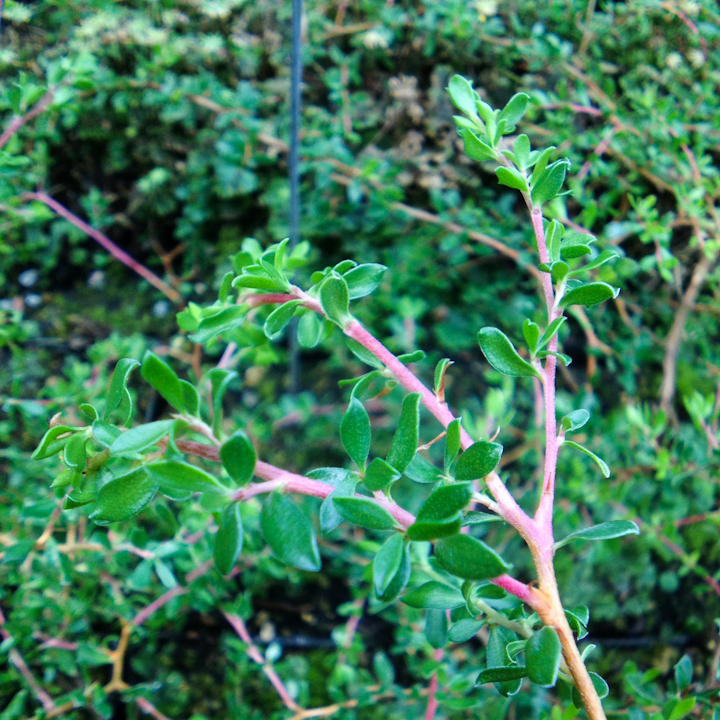 Beautiful low evergreen shrub from Australia with small bright green leaves and attractive, pinkish-red bark. In spring, light pink buds form along the branches, opening to the creamiest of white flowers. In late summer, seed pods emerge and stay on the plant through the winter and sometimes longer. Height to only 12" but spreading to 3-4' wide, making it an excellent choice above low walls or in a rockery. Full sun. Drought tolerant and deerproof. Frost hardy to USDA zone 7. Spring flowering tea tree with handsome, darkish blue leaves infused with purple, rather than the silver blue of the straight species. Similarly small and fragrant when crushed or brushed, and is a perfect backdrop for the 1", single, white, fragrant flowers in early summer. Evergreen, reaching 5-10 ft tall x 3-5 ft wide in full sun to light shade where soil is well-drained. Needs little summer water once established. Frost hardy to 10F, USDA zone 8. One of the nicest tea trees to come to us in a long time, this shared with us by Paul Bonine of Xera Plants and named after Namadgi National Park on the Australian Capital Territory/ New South Wales border. Only found in the late 80s growing on thin soils at high elevations and introduced to us recently. 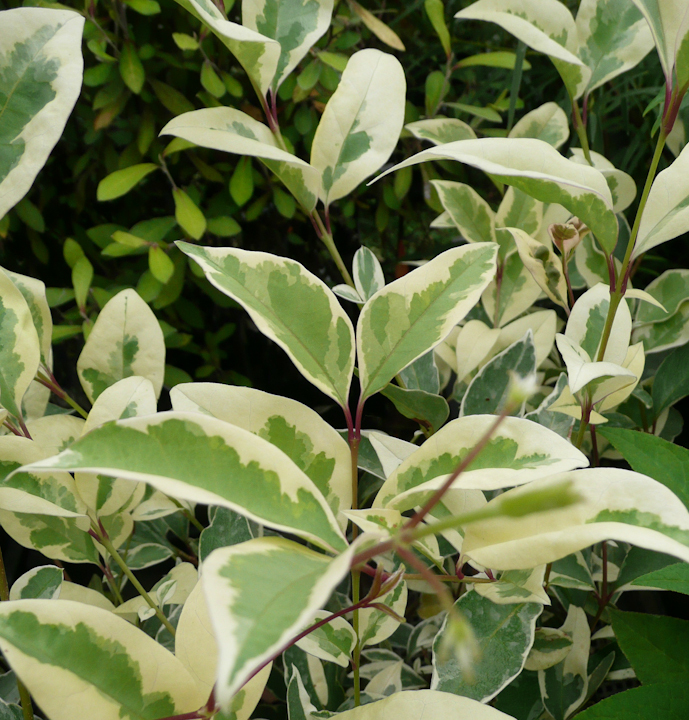 To 3-4 ft tall with small, shiny, evergreen leaves and spring flowers, white ever so slightly tinted pink, for sun to dappled shade. To us the most striking feature is the bark, peeling in sheets to a light orange. Plants in the garden should be lifted to expose this lovely feature. Good hedging or container plant and rather drought tolerant in the ground. Has been tested so far in this country to as low as 5F with no damage, therefore a confidant USDA zone 7b. A new and welcome alpine tea tree selection with gorgeous pale pink flowers with dark pink centers and flowering reliably from late spring into summer. Endemic to highland mountains of Tasmania, where this one takes its name, these tough evergreen shrubs make great prostrate specimens in the alpine garden. They can also make handsome upright shrubs in subalpine or coastal areas. Happy in almost any well-drained soil. Expect slow growth, eventually reaching 3-5' tall and 5-6' wide, a bit larger than the species. Full sun. Drought tolerant and deerproof. Frost hardy to USDA zone 8. Leptospermum scoparium is among the most beautiful of the teas so we were happy to find this one surviving robustly after a 10F winter in Seattle's Washington Park. Though a shrub to under 4 ft at the time there, in our garden, with a little more heat, it quickly lept to a 4 x 8 ft specimen with deep green, burgundy tinted leaves and clouds of white flowers in spring. We kind of think of it as a purple Italian cypress for bright conditions and some summer water especially in dry climates. We declare it hardy easily to the mid teens F so, USDA zone 8b, and possible to mid USDA zone 7. A rare but most useful fall-flowering perennial, sometimes semi-woody in mild climates for dappled shade. The 4-5” leaves are a velvety light green to chartreuse with cream edges in this lovely Japanese selection. The autumn flowers, a light lavender, are a very nice contrast and useful for late season effect when there is little else in bloom. This Japanese selection, brought to North America by plantsman Barry Yinger, enjoys evenly moist soil in shade to sun in particularly moist places. Endures in temperatures to at least USDA zone 5. Useful iris family relative from New Zealand with green, somewhat stiff, grassy leaves forming fan-shaped clumps, the creamy white, late spring flowers, standing above on airy, arching stems. To 24-30" tall in clumps to 15" wide in sun to part shade with good drainage, lean soil, and regular summer water. Evergreen to the mid teens F, mid USDA zone 8, and root hardy to at least 5F, mid zone 7, resprouting from the ground once cut back. A New Zealand iris relative with fan-shaped green leaves, tinted yellow with a center stripe of orange or yellow. This form, from the University of California at Santa Cruz collection, is a most attractive, miniature form with narrow, clumping rosettes or fans to only 6" tall. 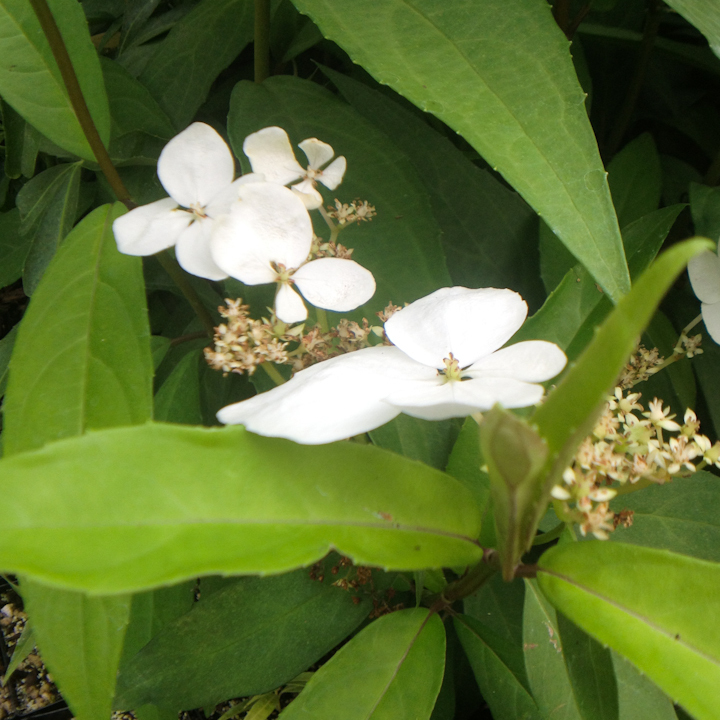 Dainty white flowers, held above the foliage in spring, turn to orangish berries in summer. Loves full sun or dappled shade and occasional summer water. This UCSC collection, though coastal, has endured temperatures below 20F and is expected to be frost hardy in upper USDA zone 8. Forget all you know about privets. This plant rocks! with its tricolor leaves in cool white-grey-green and panicles of tiny white flowers in spring for hummingbirds and butterflies, followed by tiny black fruits (drupes) that birds love. Evergreen, these are easily maintained as large shrubs or small trees, to 6-10 ft tall, useful as single specimens or as a screen or hedge. Happy in full sun to almost full shade with good drainage and regular summer water. Rewarding in that difficult spot. Frost hardy to 0F, USDA zone 7. 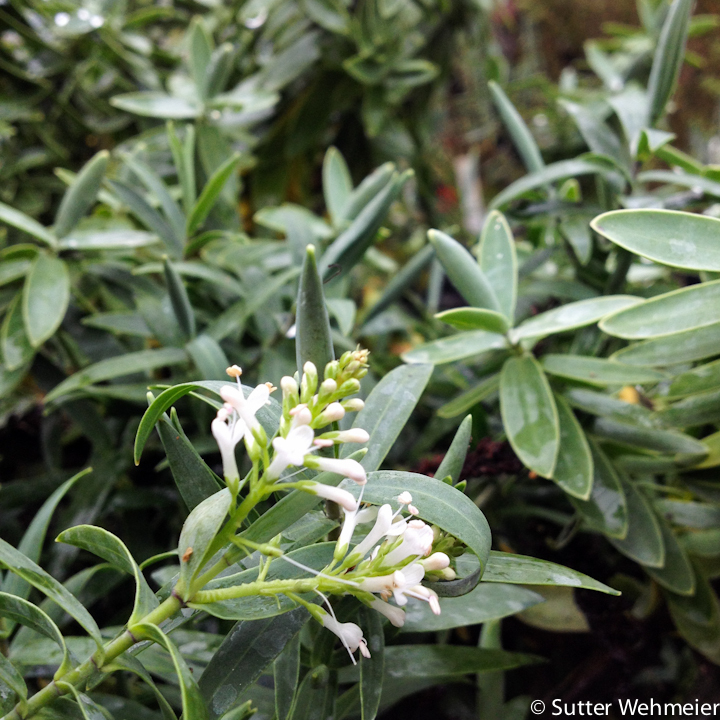 Tiny leaved privet with a dainty look and very good behavior in the garden. The parent was approximately 5 ft tall by 2 ft wide; could be a bit taller. Makes a good screen or hedge. These we received from Kevin Hughes at Hampshire’s Spinner’s Nursery. Evergreen in upper USDA zone 7 and above; deciduous or semi-deciduous in low zone 6 or so. These perennials are grown from virus free stock raised from seed that was wild collected in its native habitat in the Siskiyou Mountains. Stems, to 24-48" have waxy, glaucous leaves in whorls and, in early summer, produce stunning, brick-red flowers, bell-shaped and pendant with dark spots on the inner petals, up to 9 per stem. A drought tolerant lily that prefers well-drained, mineral and little summer water. Frost hardy to at least 0F, USDA zone 7. A durable ground cover for full sun to full shade, with narrow, dark green leaves and white, grape hyacinth-like flowers rising above the foliage on 6" spikes in early summer. Slowly spreads by underground rhizomes to form small clumps 1-2 ft wide. Good under trees or shrubs where grass refuses to grow. Full sun in cool, coastal conditions; a bit of shade in hotter places. Evergreen in USDA zone 7 and frost hardy in zone 6. 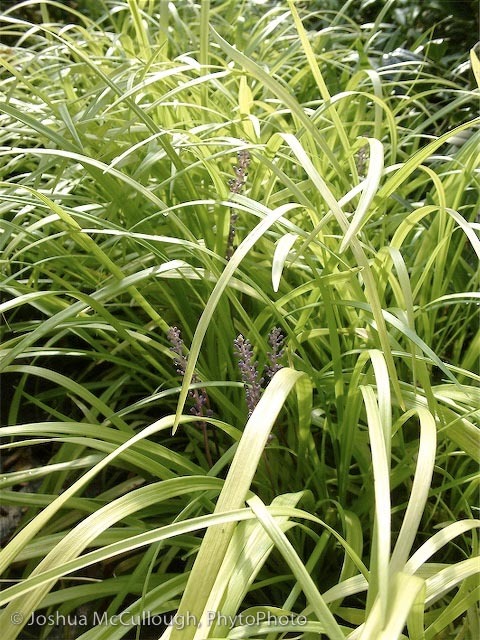 This golden-foliaged monkey grass, from the highlands of Kentucky, can take a bit of shade and still flower just like the regular green one, producing purple clusters in midsummer, a great contrast with the chartreuse foliage. Accepts half sun to full shade, growing to 12” or so. Useful as edging or in a container. Be the first on the block with this stunner. Frost hardy to USDA zone 6. This dwarf tanbark oak, found growing on serpentine soils in the Siskiyou Mountains of southwest Oregon into California is a prize for rock gardeners and non-rock gardeners alike. 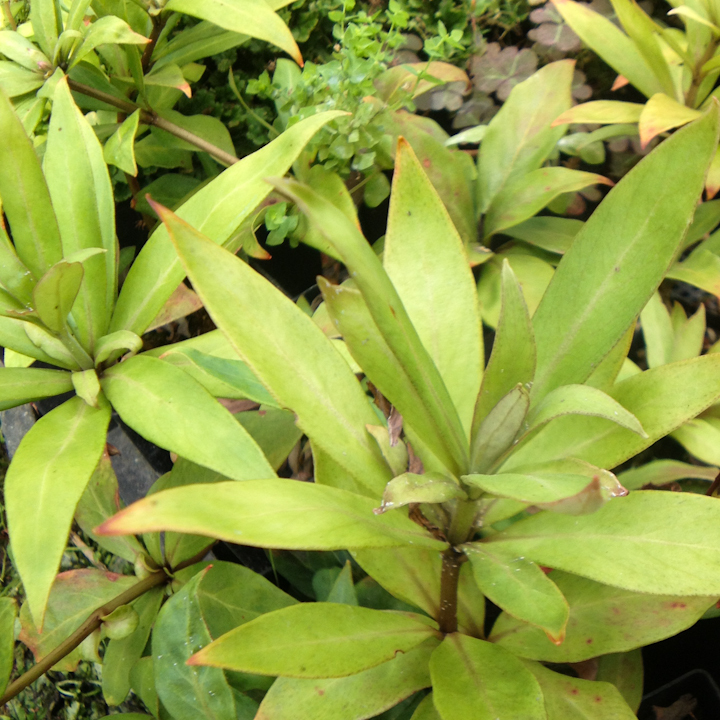 Blue Leave and new growth with golden indumentum. Yum! To only 3-5 feet at maturity and that fairly slowly. Full to part sun, lean and well-drained soil, with no summer water. Frost hardy in USDA zone 7, possibly into zone 6. An extremely durable perennial for the mixed border, this Mexican native tosses red and orange, tubular flowers all summer to delight the hummingbirds. 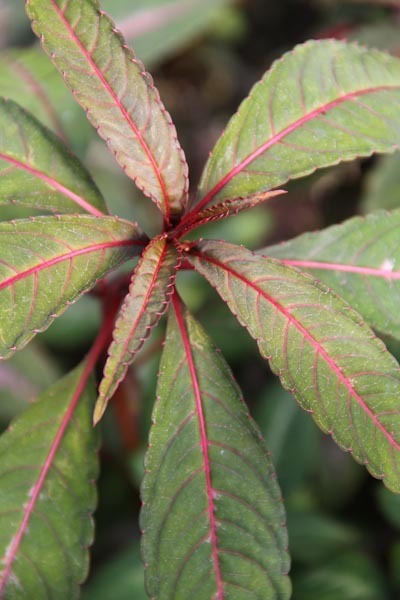 To 1-3 ft tall, spreading by underground rhizomes to forms clumps of red stems with attractive, narrow green leaves. Easy in sun to shade with average summer water. Dies back when temperatures drop into the low 20s and recovers easily at 10F, USDA zone 8. Upright large shrub to small tree. To up to 25 ft tall and 12 ft wide over time, with long, lance-shaped leaves, toothed on the margins. Summer flowers, white and honey-scented, are produced in frilly clusters followed by small, winged fruit. Native to mountainous regions of Victoria and New South Wales in Australia, these plants enjoy light shade to full shade with good drainage and plentiful summer water. Sadly not for the humid Southeast. Frost hardy in lower USDA zone 8. A Cistus introduction. This golden sport, occurring in our own garden, has retained all the vigorous characteristics of L. japonica without the propensities for leaf loss of L. japonica 'Aureoreticulata'. Reaching to 6 or 8 ft with uniform, warm golden leaves on orange-red stems and the typical, yellow-cream flowers. This has been a beautiful addition to the honeysuckle world. For nearly full sun to dappled shade, the leaves appearing more towards chartreuse in shady conditions. Occasional summer water is desired. Frost hardy to -10F, USDA zone 6 at least. Named for Nancy Goldman, Portland plantswoman and lover of all things shiny or golden. Golden leaved honeysuckle shrub for the shaded garden. Blooms sparsely in spring, the small white flowers followed by small, bluish fruits. Slow growing, to only 3-4 ft tall and wide over time and smaller than other golden forms, with arching branches that add texture and bright golden accents. Tolerates sun but tends towards a more chartreuse color. Enjoys summer water but tolerates some drought once established. Frost hardy to -20F, USDA zone 5. If you are going to commit a horticultural faux pas, you might as well do it with this. 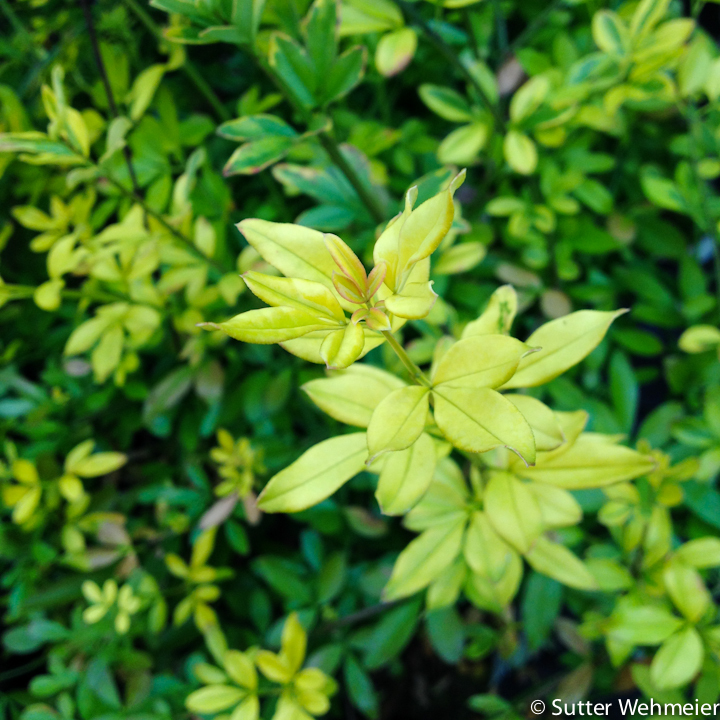 Evergreen shrub, to 4-6 ft with tiny green leaves edged yellow, remaining so in a bit of shade; variegation becomes less distinct, more overall yellow, in brightest light. ‘Lemon Beauty’ makes a very nice low hedge. As a single plant, it shines. Sun to part shade with normal water. Frost hardy in USDA zone 6. 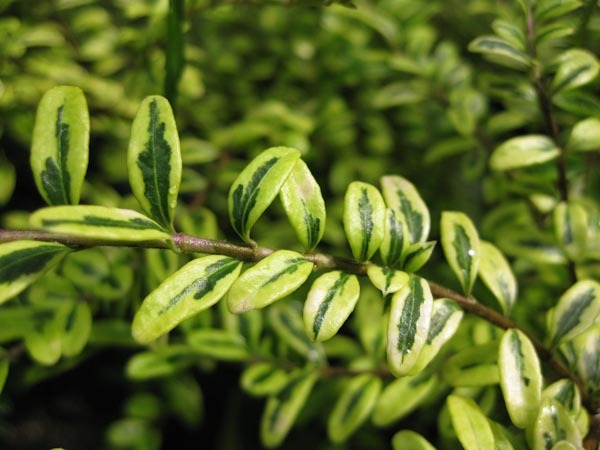 Tough and useful evergreen shrub for full sun to bright shade, this with handsome, variegated foliage, light green edged in white. Occasional small cream flowers produce purple berries. Good for a finely textured hedge or garden specimen. Grows slowly to 6 ft or so, but easily sheared to shape. Frost hardy to -10F, USDA zone 6. 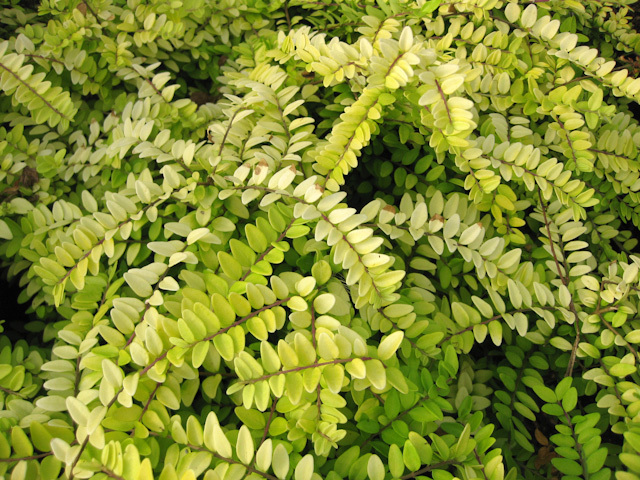 Sweet version of a classic, landscape plant with tiny golden leaves that hold their color well. Smaller than the species, growing slowly to 2 ft tall and wide, dense and, indeed, twiggy, these are excellent as hedging, border plants, or single specimens creating a bright spot in sun to part shade with average summer water. A New Zealand introduction, evergreen to 10F, USDA zone 8, and cold hardy to -20F, zone 6. This robust selection of the deciduous, 6-8 ft shrub was introduced by the late and great gardener, Jane Platt. It’s most outstanding feature is the white, 1” trumpets that begin opening as early as November, most often in December, lasting through April in great fragrant abundance. That said, a plant for the background but within 15 ft of the front door. We prune ours back slowly over the winter by harvesting the small, upright branches from those larger arching ones, for continuous winter bouquets. Sun to part shade. Drought tolerant, though some summer water in dry climates helps bud formation. Frost hardy in USDA zone 6. Evergreen perennial to about one ft high and slowly spreading with gold speckled yellow-green leaves and spidery yellow flowers. Tough, requiring only consistent moisture and protection from the harshest sun. Looking good year round. Good in containers. USDA zone 7. Dan Hinkley's collection from China's Emei Shan from whence have come so many exciting plants, this is a striking, evergreen perennial with dense clusters of golden-yellow flowers all summer long atop stems to 10" tall or more. Forms well-behaved clumps of whorled foliage, the leaves dark green and shiny with hints of bronze, in sun or part shade where soil is well-drained and some summer water is provided. Frost hardy to 0F, USDA zone 7.